The Basilica of Sant'Apollinare Nuovo was originally constructed as an Arian church by Theodoric the Great in the late 6th century. In 561 AD Emperor Justinian I reconsecrated the church as a Catholic Christian church and it is from this date that most of the Byzantine Roman mosaics date. Running along one side of the aisle is a continuous mosaics of a procession of 22 Virgins led by the Three Magi towards the Madonna and Child surrounded by four angels. 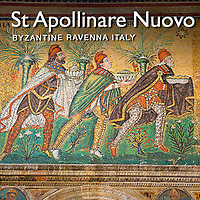 This mosaic is beautiful in its simplicity and the procession points towards the Apse of the church where the altar was. On the opposite side of the Aisle is another continuous mosaic depicting a procession of the 26 Martyrs led by Saint Martin and including Saint Apollinaris moving towards Christ on his throne. Download Royalty Free stock photos of the mosaics of The Basilica of Sant'Apollinare Nuovo or buy as photo wall art prints on line.